Our Leadership in Training (LIT) programs provide an amazing experience focused on individual development, team building, and self-discovery all while having fun at camp. With a schedule that is unique to their villages, they spend time learning about leadership, as well as practicing and developing their skills. Campers leave our LIT program more confident of their skills in public speaking, decision-making and problem solving. The LIT program includes a 3-day overnight backpacking trip on the Appalachian Trail, off site-volunteer projects, and planning and delivering a non-denominational chapel service for all of camp. For campers who have participated in our LIT program, or who are looking for an experience longer than two weeks, we have our Jedi (LIT II) program. This has an additional focus on the behind-the-scenes aspects of our camp programs and involves experience leading large group all-camp activities, a two-night overnight to Glacier Mountain, and a legacy project at camp. Our Counselors-In-Training program is an extensive continuation of our leadership development programs with a particular focus on leadership with children in a camp setting. This four-week program offers campers the opportunity to work on counseling skills, conflict resolution, program development and more. The first week of this program includes extensive training’s followed by assisting in our day camp programs, behind the scenes of camp, and our overnight camps. 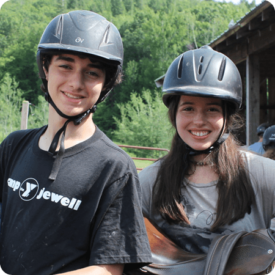 The Maverick program is designed for those campers with a greater interest in horseback riding. With a similar focus to CITs they spend their time learning how to assist riders develop skills with a focus on safety procedures. They also explore different techniques for teaching. The experience with both programs is a great way to begin working with children–many of our regular staff began their camp careers as CITs. Campers must be 16 years of age by December 31 of the year they attend camp to participate in either program.